Ramon Rodriguez-Chapa, 97, who lived in Glen Rose, passed away on Tuesday, October 30, 2018. A service will be held at 11:00 AM, Saturday, November 10, 2018, at Wiley Funeral Home Chapel in Glen Rose, TX. Visitation will be 6:00 PM -8:00 PM, Friday, November 9, 2018, at Wiley Funeral Home, Glen Rose. Ramon was born on August 31, 1921 near Tamaulipas, Mexico, to Ramon and Jenita Rodriguez. He was a loving husband, father, grandfather and great-grandfather. Ramon was loved by every person he encountered. He had a very kind, generous spirit, and his laughter would light up the room around him. He owned a barber shop in Chicago, Illinois, where he raised his children and grandchildren. He spent his retirement with his family, living in Texas. 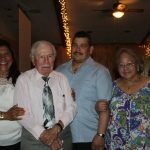 He loved spending time with his family, he also enjoyed spending his summers with great-grandchildren, walking outside, listening to music, watching his “telenovelas”, playing the violin and accordion. He was preceded in death by his parents, wife Juanita, son: Jose Ramon Rodriguez, and grandchild: Jodi Rodriguez. Ramon leaves behind his children: daughter, Maria Imelda Esquivel, son, Sergio Rodriguez & wife Marylou, and daughter, Alma Rosa Elizondo and husband Omar, along with his grandchildren: Fred Esquivel, Kathy Esquivel, Pierre “Martin” Esquivel, Adrian Esquivel, Jose Rodriguez, Jr., Juan Rodriguez, Veronica Rodriguez, Jeff Rodriguez, Jared Rodriguez, Sergio Rodriguez Jr., Sandra Rodriguez, Silvia Rodriguez, Stephanie Rodriguez, Juan Ramon Rodriguez, Cynthia Rhaburn, Michele Buenfil, and Esmeralda Elizondo, and 30 great-grandchildren. To my wonderful great-grandpa, we will miss you very much. Thank you for being apart of our lives and watching us grow. Thanksgiving and Christmas will never be the same, but we will keep you in our hearts. Love you.